Part of our fun series on aviation history. Designer-genius R. Buckminster Fuller was one of the 20th century's great dreamers. He conceived of the Dymaxion as a flying automobile or drivable plane, with jet engines and inflatable wings. It was a link in his futuristic vision of people living in mass-produced houses deposited on the landscape by dirigibles. Deprived of wings, the Dymaxion was a three-wheel, ground-bound Zeppelin, with the rear wheel trailing on a huge levered arm and swiveling like the tail wheel of an airplane. The first prototype had a wicked death wobble in that rear wheel. The next two Dymaxions were bigger, heavier, and only marginally more drivable. 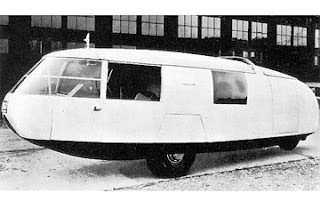 The third car had a stabilizer fin on top, which did nothing to cure the Dymaxion's acute instability in crosswinds. A fatal accident involving the car (cause unknown) doomed its public acceptance. Though unworkable, this three-wheeled oddity was the boldest of a series of futuristic, rear-engined cars of the 1930s, including the Tatra, the Highway Aircraft Corporation's "Fascination" car and Germany's National Socialist KdF-wagen.